Herdir, an Imperial warrior, is the Dungeon Master of the House of Dementia. His specialty is torture, and during the related quest his services will be at your disposal to investigate a conspiracy against Lady Syl. Before the related quest he will be found continuously pacing the torture chambers, never even eating or sleeping. Once the related quest is active he will act as a follower, but only inside the boundaries of New Sheoth. Every time you ask him to 'extract information' from a citizen, he will happily oblige. Once the conspiracy is unmasked, he will resume his former duties. He wears matching patchwork shirt and pants and a pair of braided leather sandals. He doesn't wield any weapons, relying solely on his fists and on a Heal Minor Wounds spell. 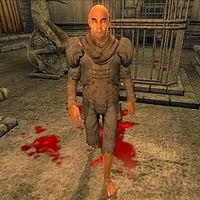 Before the related quest, Herdir will not have anything but rumors to share, but once Syl appoints you the position of Grand Inquisitor, he gets much more talkative: "What brings you to this delightful corner of the House of Dementia? How may I help you?" If you tell him to come with you, he will say: "That's rather forward of you, don't you think? We've only just met and already you're ordering me around...I must say, I enjoy this take-charge attitude. I presume you are the Grand Inquisitor, then? Lady Syl said she'd be appointing someone. Shall we get to work? There's much to be done. So many people to visit." If you, however, introduce yourself as the Grand Inquisitor, he will be less impressed: "Are you? Hmm. I'd expected an entrance with a bit more flair. Ah, well. Perhaps you'll grow into the role. One can hope, eh? Now, we've much to do. Lady Syl is not a patient woman, as I'm sure you've seen. Shall we begin?" If you ask him to follow you, he will say: "Ah, I do appreciate an assertive leader. I look forward to working with you on this assignment. Lead the way, Grand Inquisitor!" If you ask him for hints about what to do he will be annoyed: "Isn't it obvious? We need to search through Crucible, looking for these traitors. Talk to whomever might have information. If they're reluctant to help, you just say the word and I'll do my best to persuade them. Really, we should be going. Her Ladyship expects results!" When asked about the conspiracy, he will tell you the truth about Syl: "I don't expect we'll learn much. While I have the utmost respect for her Ladyship, she is well known for being... overly cautious. We must carry out her wishes, however. And I, for one, am looking forward to, ahh... interacting with the citizens of Crucible." When collaborating with Herdir, you can choose between several options; if you ask him to follow you he will reply: "Of course, Inquisitor. I look forward to working with you." If you ask him to wait on the spot, a disappointed Herdir will respond: "Are you quite sure, Inquisitor? Very well... Please don't have too much fun without me." During the related quest, Haskill will advise you to make use of his "talents": "You have been asked to work with Herdir, I understand. Herdir has a great affinity for his work, and can be a very useful ally to you. Do not hesitate to make use of his talents." and "You may find the enormity of your task daunting at first. Use Herdir's talents to aid you with those who are unresponsive to questioning." After the quest, the people around the Isles will ironically comment on Herdir's talents. Local kleptomaniac Brithaur will admit: "I once met Herdir after a misunderstanding about some candlesticks in Syl's great hall. He's not a bad fellow, actually." In Fellmoor, another paranoid individual, namely Ranarr-Jo, will say: "Once again, Syl uses pain to get what she wants. How long before every one of us is forced to visit Herdir's chamber?" During your investigation for Syl, Herdir will, with a high enough disposition, provide tips and hints on what to do next. If his disposition is too low, he will simply say: "Really, Inquisitor. Are you not supposed to be the one in charge here? I can't do all your work for you." and "Inquisitor, I am surprised that you do not have a better grasp on the situation. This is most disappointing." When willing to help you, there will always be two options available and Herdir's tips will change with each quest stage. If he lacks any tips he will simply say "Very well, Inquisitor." Who should we be looking for now? "As we're just starting out, we need to find a place to start. Someone who knows something. We may have to torture dozens of people before we find one who knows something. How exciting! I shall follow you through Crucible. Speak with the citizens, and ask what they know about this supposed conspiracy." "I don't know! Isn't that wonderful? It could be any of them... All of them, perhaps. We'll just have to start torturing people to find out!" "It would seem that Anya Herrick may know something. It could be nothing, but it's certainly worth following up on, don't you think? We should have a little chat with her as soon as possible. I look forward to it; I get the feeling she avoids me at times." "Anya Herrick, dear Inquisitor. She's been named as someone of interest. I do look forward to chatting with her, don't you?" "Anya claims to have been approached by Ma'zaddha. Perhaps there's something to this after all. We should find him soon. If he knows something, it might be a key to what's going on in Crucible." "According to Miss Herrick, Ma'zaddha has been pressuring her. He would be our next target, if you will." "Ma'zaddha is reluctant to speak to you, and I assume there's good reason. It would be worth finding another way to get him to talk. There must be someone in Crucible who knows more. We should talk to more people about what's going on." "Ma'zaddha is clearly withholding something. It would seem that direct pressure has no effect, so we'll have to try another route. Perhaps we can convince someone else in Crucible to tell us a bit more about his recent activities. That might loosen his tongue." "Ma'zaddha is meeting Nelrene at night. How illicit! Make every effort to be present for this conversation. It may give us something to hold over Ma'zaddha and get him to talk." "If Ma'zaddha has indeed been consulting with Nelrene of her Ladyship's guard, that would provide us with some excellent leverage. If the two meet regularly, you might have a chance to eavesdrop and learn more about what's going on." "Your task now is to listen in on Ma'zaddha's conversation with Nelrene without being noticed. It hasn't worked very well so far, but I have no doubt that you will persevere, Inquisitor." "Very well, Inquisitor." "You've heard Ma'zaddha. Isn't it time to confront him with that fact?" "After overhearing Ma'zaddha and Nelrene, I'd say you have quite a card to play the next time you speak with him. I certainly look forward to that interaction." "You have a few options, I believe. Either wait for Ma'zaddha to return with more information, or have a chat with Nelrene in the meantime." "Ma'zaddha has been most helpful! We'll have to see what he comes back with. In the meantime, you might consider speaking with Nelrene." "Nelrene is clearly withholding information. Persuasion might be in order, or perhaps Ma'zaddha will have something that will help." "Nelrene is lying to you, Inquisitor. She knows more than she tells. You should address that as soon as possible." 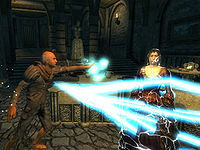 "Ma'zaddha was able to provide some useful evidence, even if he did not survive to see it put to use. It's time to confront Nelrene again." "Very well, Inquisitor." "You have what you need, don't you? Time to seek out Muurine, I think." "You have the evidence you need. It's time to bring in Muurine." I hear there's someone new in the Shivering Isles. I do so enjoy making new friends. The Gatekeeper's been killed, I hear. Now who knows what new faces I'll get a chance to mangle. I had rather enjoyed the Resonator being broken. Greater opportunity for meeting someone new. Thadon has his Chalice. That'll anger Syl, I'm sure, which means more work for me. My, but it has been busy here lately. I do so enjoy a good conspiracy. The Great Torch burns again. That'll boost spirits around here. A shame, really. Oh, I must say I was sorry to see Syl go. She always kept me busy, and when I'm busy, I'm ever so happy. Thadon has died. I hope he didn't go quietly. The Fringe has been attacked. I'm more than willing to help find out who's responsible. Quite a shame that there's a new Gatekeeper. I'd been hoping to meet a few more friendly faces. No precious army will bring back Lady Syl. Without her, who will let me do what I do best? With the whole Realm in jeopardy, my days of work may be at an end. How truly sad. Now that things are returning to normal, it's high time I prepare my chamber for some new visitors. His Shock Damage torture spell is actually a scripted effect and he will only cast it during the related quest. Herdir appears in Legends as the Eager Torturer card. This page was last modified on 19 January 2019, at 19:51.